Until today, quality education in Haiti has been available only to very few. This is due to brutal socio-economic impediments, including a well-entrenched language barrier: French, the primary language of instruction, is spoken by a tiny élite (no more than 10% and perhaps as low as 3%) whereas Haitian Creole aka “Kreyòl” is the one language spoken by all. In this article, I’d like to share a Haiti story to inspire current efforts to open access to quality education on a global scale. Once upon a time, in 2010 actually, with the help of colleagues in Haiti and at MIT, we began an MIT-Haiti Initiative to modernize and democratize education in Haiti. Since then, we have been working on the creation, evaluation and dissemination of high-quality digital technologies that use Kreyòl as an indispensable tool for active learning—active learning that is both constructive and interactive. This is the first time that online resources in Kreyòl are being created for science and math at universities and high schools, and we are thankful to MIT, the Wade Fund, the Foundation for Knowledge and Liberty (“FOKAL”) in Port-au-Prince, the Open Society Foundations and the National Science Foundation for their support of this project. In collaboration with various institutions in Haiti (FOKAL, Université Caraïbe, Faculté des Sciences and École Normale Supérieure of the Université d’État d’Haïti, École Supérieure d’Infotronique d’Haïti, Université Quisqueya, NATCOM, etc.) 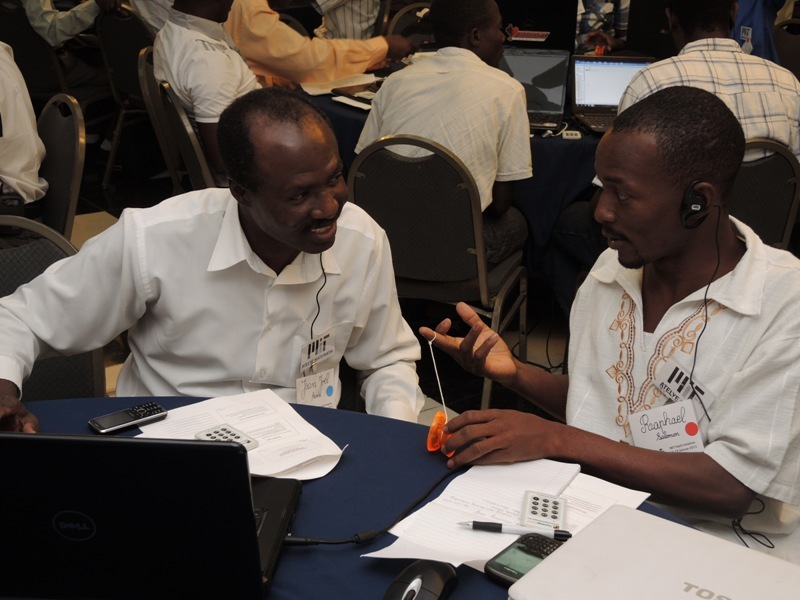 and through a series of MIT-Haiti workshops in Port-au-Prince, we are helping Haitian faculty deepen their expertise in the use of innovative digital resources for active learning in physics, biology and math. Our Initiative has registered nearly 100 faculty participants so far, and we are planning to serve more. These workshops are also creating a formal framework for a rigorous evaluation of the learning gains to be achieved through the application of these new methods by workshop participants in their own classrooms. On April 17, 2013, the MIT-Haiti Initiative signed an agreement with the Haitian Ministry of Education in order to explore ways in which these Kreyòl-based tools and methods can be incorporated in the Ministry’s own strategies for curriculum and faculty development (a link to a moving speech by Haitian Prime Minister Laurent Lamothe on that occasion). It is obvious that unfettered access to quality education depends on the use of the language(s) that are fluently spoken by students, parents and peers—the language(s) spoken on a daily basis in the students’ homes and communities. If designers of technology-enabled educational resources do not pay due attention to the world’s linguistic diversity (including local languages such as Kreyòl in Haiti), technology-enabled education will not, and cannot, become available to all. Moreover, by ignoring the world’s linguistic (and cultural) diversity, we also miss out on the opportunity to learn about diverse ways of learning. Indeed, digital pedagogical resources offer a great opportunity for “a global laboratory for rigorous learning about learning” (in the words of MIT President Rafael Reif) and such laboratory can be greatly enriched by the world’s cultural diversity when it comes to learning—an additional opportunity not to be missed. When students can use their mother tongue to build foundational knowledge through active-learning methods in reading, writing, science and math, they are, subsequently, in a better position to master second languages and, then, to use these second languages to build additional knowledge. In the particular case of Haiti, the mother tongue for the vast majority is Kreyòl, and the second languages should include, at least, French, English and Spanish. Conversely, students who are forced to learn the basics of reading, writing, math, science, etc., in a second language that they can hardly speak are usually bound to a lifetime of academic mediocrity, except for the most talented. This state-of-affairs is suggested by our field research in elementary schools in Haiti where children in the early grades (1st through 3rd grades) achieve much higher reading scores (up to three times better!) when instruction takes place systematically in Kreyòl. Those students who cannot benefit from such instruction in the mother tongue seem likely to remain poor readers and, thus, poor learners for their entire lives. These facts have a logical consequence that is of extreme importance for Haiti: Pedagogical resources must be provided in Kreyòl if we wish to create a solid system for active learning and for in-depth research and innovation, a system that provides all students with the basic resources to become proficient in reading, writing, science, math, etc. In such a system, many more students will have the opportunity to become professionals who are better prepared to tackle and solve their own problems and problems that affect their communities and their country. Such a system also gives those students who speak Kreyòl only (the numerical majority in Haiti) a better cognitive basis to learn second languages such as French, English and Spanish. Without such a system, it is only a tiny handful of Haitians who will continue having access to quality education. This will continue blocking our country’s development. In spite of our best efforts at introducing Kreyòl-based active learning at the primary-school level, those efforts will not achieve much if the teachers themselves are not comfortable with these new methods. Through our MIT-Haiti workshops in Port-au-Prince, Haitian faculty are becoming fluent in Kreyòl-based methods for active learning in science and math at universities and high schools. This series of workshops seems germane to the goals of the Haitian State’s 2010–2015 Operational Plan toward modernizing Haiti’s educational system. We have taken software tools such as StarGenetics in which one can do virtual genetic experiments (on genetic crossing, for example), and we have translated them into Kreyòl. We have done the same with a range of other resources: software tools to visualize proteins, software tools to simulate physics experiments (in electromagnetism, electricity, movement, etc.— ), software tools to visualize the solutions of certain mathematical equations (i.e., the Mathlet applets for differential equations), and so on (access to sample these innovative resources). The Kreyòl-based digital active-learning technologies that are being developed by the MIT-Haiti team stand in stark contrast vis-à-vis the old methods of rote memorization still common in Haiti and many other countries. When we introduce software tools in Kreyòl for active learning, we see very quickly how teachers and students alike come to understand core concepts that they had difficulty understanding before that. And the learning happens with the sort of joy that is rarely seen in the context of the traditional French-based system (example among 4th graders in Haiti). Before the MIT-Haiti Initiative began, there were no online materials in Kreyòl for university-level science and math. We have found a remedy for that ill: online Open Education Resources plus the collaboration between educators in Haiti and abroad. These efforts are, for the first time ever, creating high-quality materials for science and math in Kreyòl and making them available for free on the Internet. Haiti’s unfinished revolution: a language barrier between the élites and the masses? The motto on the Haitian flag reads “L’union fait la force” (i.e., “Unity makes strength”). This motto reminds us that the 18th-century Haitian Revolution succeeded because blacks and mulattoes, enslaved and free people came together to show the world that each person, no matter their race and history, is indeed human and equally deserving of freedom and dignity. Yet, today, Haitians who speak Kreyòl only (the numerical majority) are largely deprived of equal access and equal opportunity, especially equal access to quality education. Indeed, throughout Haiti’s history, French has been the de facto language of academic and socio-economic success whereas the country’s socio-linguistic and economic conditions have made it virtually impossible for the masses to become fluent in French (more on this below). This “élite closure” seems impenetrable as the perceived superiority of French over Kreyòl is often internalized, from a tender age, by those very Kreyòl-speaking Haitians. The latter are effectively handicapped and excluded by the pressure to learn and speak French in schools and other venues that make it largely impossible for them to do so successfully. There has been some progress, most notably the “Bernard Reform” of the 1980s where the Ministry of Education, headed by Joseph Bernard, promoted Kreyòl as a language of instruction. But the Reform fell short of its objectives. More recently, the government, in cooperation with international agencies, has launched some valiant efforts to increase access to education. The most recent and most talked about effort is the Haitian government’s “Programme de Scolarisation Universelle Gratuite et Obligatoire” (PSUGO) started in 2011 toward a free and obligatory universal schooling program. How do these recent efforts fare vis-à-vis the language barrier that has long blocked education for all in Haiti? In the 2010-2015 Operational Plan, the government announced the goal of “balanced bilingualism” whereby the whole country would eventually become equally fluent in both French and Kreyòl. Given abject poverty levels and the many challenges to develop Haiti, how can a country with a majority of illiterates, one in which more than 90% of people speak only Kreyòl and live in Kreyòl-speaking environments, become a country in which everyone speaks and writes Kreyòl and French with equal fluency? As far as I can tell, this goal is delusory for, at least, two reasons: balanced bilingualism is a rare phenomenon which depends on early immersion in both languages; second-language learning in any country is all but impossible without adequate immersion in that second language or adequate access to teachers who are proficient in the target language. Both conditions are sorely lacking in Haiti for the learning of French while there are more urgent needs still unfulfilled, including the need for basic facilities (from electricity and running water to decent libraries) and the successful teaching of foundational knowledge in literacy, science, math, etc. Therefore the goal of “balanced bilingualism” runs the risk of shifting (too few) precious resources to education projects that seem likely to fail: one cannot reasonably expect teachers in a country with so few resources and so many burdens to transform a 90%-monolingual population into a population of “balanced bilinguals.” This is a challenge that few other countries have ever met. Meanwhile, Haitian schools continue to impose French as the main language of instruction and examination, even when the children do not stand a chance of becoming fluent in French, and even when the professors themselves do not speak French fluently. Furthermore, though French and Kreyòl are the country’s two official languages, most publications, print media, official transactions, courts, etc., continue to favor French over Kreyòl. There’s no “balanced bilingualism” in these communications. Meanwhile the majority (i.e., those who speak Kreyòl only) still cannot fully enjoy their linguistic rights and cannot gain access to quality education. Research shows that only 10% of Haitian children who enter the first grade will finish school. Interestingly, 10% is one of the percentages that have been reported for the proportion of Haitians in Haiti who speak French in addition to Kreyòl. This language barrier is one of the reasons for Haiti’s underdevelopment, as in many other countries in a similar situation—countries where schools do not make systematic use of the language spoken by the population. In light of the history we have now sketched, there are obviously great obstacles we must overcome to succeed in our MIT-Haiti Initiative. But these great obstacles double as great opportunities for quality education (and social justice) on a global scale. The first challenge is: How should we create a new vocabulary for science and math in Kreyòl? This vocabulary does not yet exist at the most advanced levels of these fields. This is unsurprising given the widespread exclusion of Kreyòl throughout the history of education in Haiti. As linguists, we know that a language’s vocabulary is like a muscle: vocabulary develops as one uses it. The more one uses it, the larger it gets, and the more strength it will acquire so it can do what we need it to do. There are other challenges: How can we change the habits of the too many teachers and students who have invested so much in learning French (any approximation of French!) to the detriment of their progress in other academic disciplines? How can we replace the rote memorization of French texts with best practice for deep and creative learning? In order for Haitian teachers and students to engage in in-depth studies and research in science, mathematics and other subjects, we must promote a new set of habits, a culture of creativity and innovation based on active-learning methods in Kreyòl. Indeed we are creating resources that will allow students to delve as deeply and as creatively as possible into math and science—without making entry into these disciplines depend on the prior learning of French. The latter is an elusive target for most, all the more so that even the teachers are, in majority, not fluent in French. In taking the first steps toward these goals, we are creating, testing and disseminating high-quality resources for science and math in Kreyòl, using these resources in faculty-formation and curriculum-development workshops in Port-au-Prince. In turn, these professors will share these resources with their own colleagues and students. As Descartes did in 17th-century France when he started to use French instead of Latin in order to increase access to science among his French-speaking compatriots, we Haitians and friends of Haiti must promote pedagogical materials in Kreyòl if we want to spread knowledge among the majority in Haiti. This modern democratic culture of active learning is an antidote to the outdated habits of rote learning of French texts that few can deeply understand, habits that are still encouraged in most Haitian schools. We are thus working to make quality education truly available to all. If we take “all” in its most inclusive sense (to include, say, populations that don’t speak international languages such as English or French), this goal entails that we must find cost-effective solutions to any problems posed by translation, even as we build local capacity so that digital resources can be developed right off the bat in local languages, without the extra step of translation from some international language. So our work in the MIT-Haiti Initiative is tracing an example that should help the whole wide world take advantage of online educational technologies—with the assumption that not every student in the world speaks an international language. This is MIT’s Mens et Manus et Mundus at its best: it shows the way for how new online education initiatives such as MITx and EdX can maximize their global outreach to benefit populations that have for far too long fallen on the wrong side of the digital or linguistic divide. First: We are using Haitian Creole (“Kreyòl”) to make learning truly active, constructive and interactive for Haitian students. The best sort of active learning in science and math requires a great deal of reasoning, collaboration and communication. In Haiti, such active learning, especially the interactive part, cannot be done in French or English or any other language that the students, by and large, do not speak fluently. In Haiti, it is only in Kreyòl that the majority of students can truly participate in interactive learning. Second: We are using new digital technologies to improve science and math education, according to proven active-learning methods. Thanks to these technologies (for example, a variety of software tools for virtual experimentation, simulation, visualization, modeling, etc., available on the Internet or on USB drives), faculty and students in Haiti will have access to high-quality virtual laboratories on their own computers or on the computers of their classmates or teachers. Such active learning will strengthen their understanding of a variety of complex and abstract concepts. 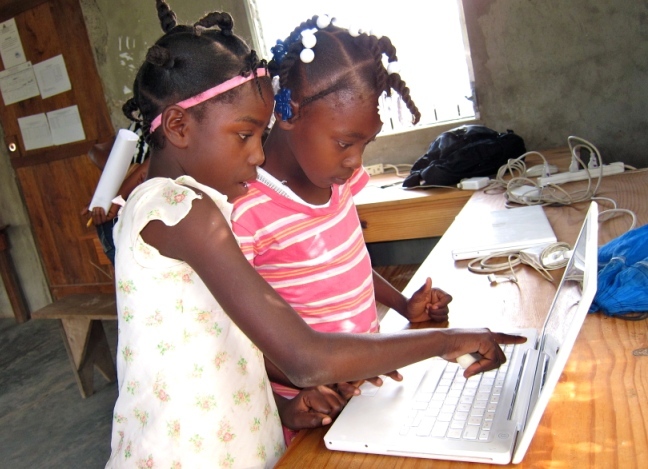 This approach will help us create a smarter Haiti, a Haiti that can lead itself toward sustainable development, a Haiti that can show the rest of the world an example of technology-enabled education made available to “all”—with “all” taken in its most inclusive sense, beyond language and digital barriers. Only when designers of digital-learning resources start paying due attention to linguistic diversity will we be able to realistically envisage a world where quality education is truly available to all regardless of accidents of birth, history or geography. Furthermore, the MIT-Haiti Initiative is opening up the pool of potential online learners—to students who otherwise would have no access to English-based resources such as those currently available via MITx and EdX. Such efforts will help insure that technology-enabled education can, at least in principle, have truly global reach to the extent that these efforts are helping us reach, and learn from, linguistically and socially diverse groups, thus incorporating diverse ways of learning into our methods for online learning. One welcome consequence is that this Initiative promotes diversity and inclusion with a profound transformative impact for all parties involved. We help educate a diverse world, as we in turn become educated by the diversity of the world we engage in. A win-win proposition! 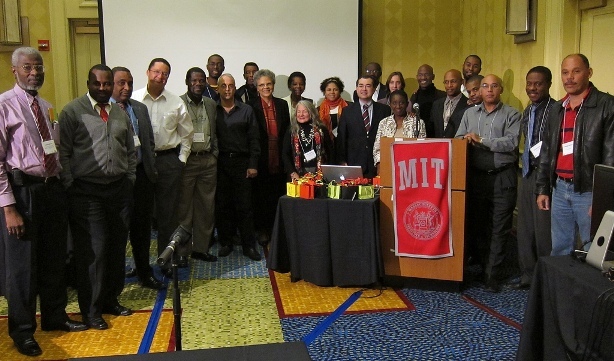 Image: Some participants at the MIT-Haiti Symposium at MIT on October 21-22, 2010. Note: This post is based on the article “‘Many hands make the load lighter’: Haitian Creole and technology-enhanced active learning toward quality education for all in Haiti” presented at the Sixth conference of MIT Learning International Network Consortium (LINC), June 16–19, 2013. Written by Michel DeGraff on July 26, 2013 in Cultural Heritage.